Preparing for a great start to summer camp. The first day of camp can be exciting and emotional for both children and parents, especially if it is the child’s first summer at camp. The difference in the big day being a positive versus negative experience is all in the preparation at home, months before camp begins. Parents should involve their child in the entire planning process from the onset of considering summer camp. Having a say in what kind of camp to attend helps campers feel as if they have ownership in the decision. Together as a family, look over camp brochures, watch camp videos, check out program Web sites and enjoy sharing all the other promotions that camps offer. Exploring the fun and opportunities that different camps provide builds anticipation and excitement. The next step is to visit a few camps and see what it’s like to be a camper at the places of interest. Even in winter and spring when the camps are quiet, you and your child can get a feel for a particular camp and its staff. Once you have chosen the right camp, the best way to allay your child’s fears is to find a friend with whom to share the camp experience. Knowing a buddy will be there on the first day provides peace of mind and sets the tone for good times right from the start. A bonus for parents, embarking on the upcoming camp session with a friendly family grants opportunities for carpooling and information sharing. With camp is just a month away, you have a few things to do. Hopefully your camp’s office has sent out a parent packet, camp newsletter or updates to get you ready for the summer. If not, head to the camp’s Web site to search for the facility’s summer guide or parent packet. This should provide a ton of answers to your “What happens when…” questions. Also try to get your hands on a camp schedule. If the camp your child is attending does not provide any of this information up front, call the camp office to get your questions answered now. Should you wait until the two weeks prior to the camp session, the staff will be too busy in final preparations to give you as much guidance as you may need. Along with connecting with the camp staff, sit down with your camper to review questions your child has about camp. The details you have gathered from the staff and possibly other parents should help you address your child’s concerns. Discuss with your camper what a normal day at camp brings, what activities are offered, how many kids are in the child’s group and other key concerns. Giving your child a chance to learn more, ask questions and express elation and fears about the upcoming summer makes the entire camp process much less overwhelming for both you and your child. Similar to how you allied with your child to explore different camp options, making final preparations together goes a long way in granting a smooth transition to camp. Boost your child’s confidence and excitement by taking your child, and possibly a camp friend, shopping for camp gear. The basics for day camp include a small backpack, continuous spray sunscreen, a hat, a reusable water bottle, a poncho for rainy weather and sneakers. Check with the camp your child is attending for other recommended items. You’ll also need to get a lunch cooler and lunch items for the first week of day camp, unless the camp has a dining hall where campers eat. Let children pick their favorite lunch coolers and a few items for lunch if appropriate, enabling kids to feel in control of their time at camp. Also designate some official camp clothing that is comfortable and appropriate for participating in sports and activities at camp. Keep in mind that clothing might get muddy, covered in ice cream or lost— all possibilities at camp. Mark your child’s first initial and full last name on every item that will be worn at camp, including your child’s socks. Most younger campers don’t recognize their own shirts if you hang the clothing in front of them. Give your child and the counselors a hand in keeping belongings in your family. Keep stress to a minimum by packing for the first day of camp the night before. Refrigerate a bagged lunch, if your child needs one. Pack your child’s bag, fill a water bottle and set out tomorrow’s clothes. Rushing in the morning only adds to any anxiety that your child and you might feel. 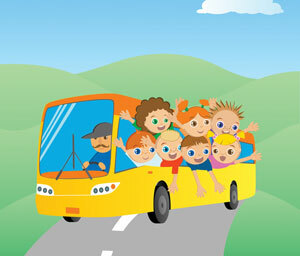 Is your child taking a bus to camp each day? Then take your child to the bus stop on day one to set the tone for a carefree beginning to camp. If you’re driving your child each day, park the car and walk your child to where he or she needs to be on day one. While keeping your child’s emotions at ease, you’ll get the chance to meet some of the counselors and ensure your child has found the right age group. Don’t be surprised if your normally talkative child is unusually quiet and shy the first day of camp; that’s completely normal. If your child is making the trip without you to camp, encourage him or her to talk to new friends and connect with counselors. If you’re escorting your child, introduce your child to counselors, take a backseat as your child meets different campers and briefly step in when necessary to get your child talking with others. The first introduction is also important for a parent. Meeting the counselors reveals who you are entrusting your child to, and hopefully builds confidence in you and your child that a safe and happy summer lies ahead. Lastly, don’t promise to pick up your child at any other time than the designated pickup time or tell your child to call you if you’re missed or needed. It only gives your camper an easy out, and that’s not fair for either of you. Going to summer camp is one of the most incredible experiences a child can have. Camp provides a nurturing environment that allows kids to make new friends, do activities they may never have done before, challenge themselves and acquire lifelong skills. Preparing for the summer makes it that much better. Scott Umbel has been a camp director with YMCAs in the Northeast for years. He is currently a camp director at the Rye YMCA and the organization’s successful Discovery Camp program. Visit www.ryeymca.org to learn more.